Oatmeal is a staple for breakfast in our home. We each prefer our own way of flavoring it after it has been cooked. My younger daughter and I typical eat it as most people would eat grits, with a bit of butter and salt. My husband and older daughter enjoy theirs with brown sugar and some milk. Either way, home-cooked, old-fashioned oatmeal beats the prepackaged stuff by a mile! 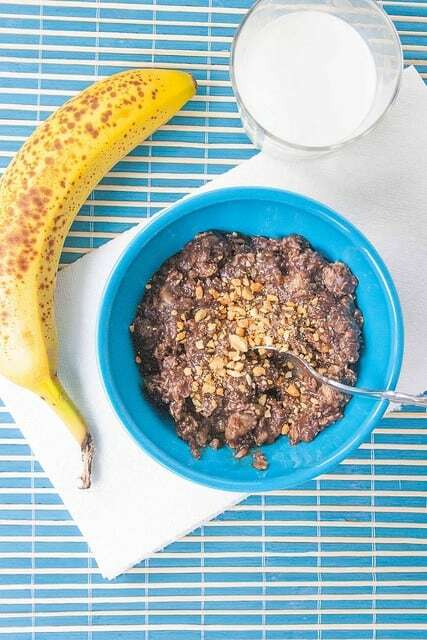 That said, I’ve been making chocolate covered bananas for several months now (will post those soon), and I thought that those flavors could be adapted to make a wonderful and healthy breakfast. I wanted to limit the sugar though, mostly because I don’t like anything too too sweet for breakfast (hence, the salt and butter in my typical oatmeal). As a result, this morning, I made this chocolate oatmeal for my mother and me. As it stands, it is not a super sweet breakfast (it is definitely sweet enough for me), but you can easily add your preferred sugar substitute or even some finely chopped Medjool dates for additional fiber and sweetness. 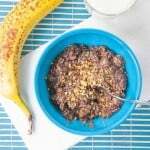 Using ripe bananas is particularly important here since this ingredient lends most of the sweetness if you do not want to add a sugar substitute. Top with salted peanuts if desired. If more sweetness is desired, add your favorite sugar substitute or some finely diced and pitted Medjool dates. Mmm – sounds good to me! I love having oatmeal in the mornings as the weather turns colder, and I always mix it up a little differently. Sometimes it’s banana and peanut butter, sometimes it’s pumpkin puree and some pecans, sometimes it’s cinnamon and apple… I love that you use salted peanuts on top for some salt and crunch – will have to try that! Oh, those ideas sound great! Thanks for sharing – will have to try soon.